Dalal Scarbrough (left), Linguistics major, asks about information to transfer to U.C. Berkeley while Simran Thiara (right), Economics major, acquires information to transfer to Sacramento State. Photo by Luisa Morco. Students who are looking for a little extra financial boost can apply for scholarships through the SCC Foundation or the City College Transfer Center. Both the Foundation and the Transfer Center offer several scholarship opportunities for students, many of which require very little effort to apply, according to the facilitators of the programs. The official website for the SCC Foundation states that scholarships are available to students who completed a minimum of 12 units at City College by the end of the 2013 fall semester and are currently enrolled in at least six units. Students must also meet the basic requirements for each scholarship and can apply for up to 10 different awards. 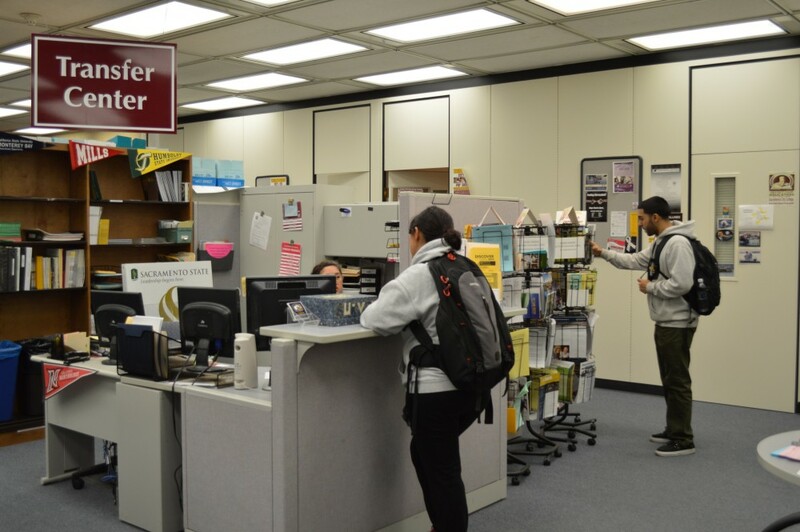 The deadline to apply is March 7 by 4 p.m.
Additionally, the Transfer Center offers services, information and opportunities for students on how to put even more money into their college funds. On Feb. 11 from noon-1 p.m. in the Learning Resource Center, room 141, there will be a workshop to help students gather more information about these opportunities. Ann Love, public services assistant in the SCC Foundation office, explained that the process to apply for scholarships, which are offered by various alumnus donors and other organizations, is simple, allowing interested individuals to easily navigate the online application system and complete the essays for those scholarships that require them. Recommendation letters are filed on behalf of students by faculty members, and students applying for scholarships are responsible for requesting them. “Having only one recommendation, instead of the required two, can make the difference between receiving the award and losing it to a more conscientious applicant,” said Love. For more information on the SCC Foundation scholarships, visit www.scc.losrios.edu/About_SCC/Foundation/ Scholarships. For more on the Transfer Center workshops and scholarship opportunities, visit Rodda North 147, call (916) 558-2181 or visit www.saccity-online. org/transfercenter/scholarships. This entry was posted in News, Sac City Express (SCC) and tagged City College, sac city, sac state, sacramento, Scholarships, Transfer Center. Bookmark the permalink.